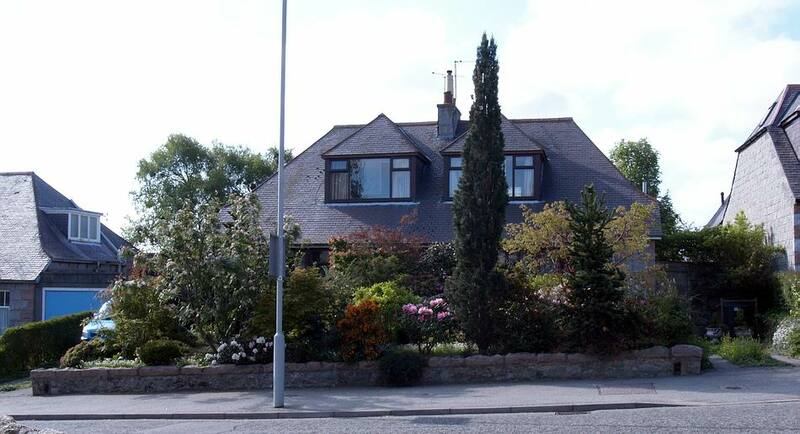 Here is our house which was two semi-detached houses but we knocked through to make it one many years ago. As you can see there is not much room for more plants in the front garden either, with plenty trees and shrubs underplanted with woodland type plants and bulbs. As I have shown you in previous logs in an attempt to utilise every centimetre of space we have planted up the two drive-ins. The drive on the left is where we park our wee car and I have some plants growing in the central gravel area - it is the drive on the right where I have been sowing seed for longest. The reason I was through to the front taking pictures is because I wanted to show you how we are not restricted to our own garden but have also invaded the areas around the street trees with plantings of bulbs. 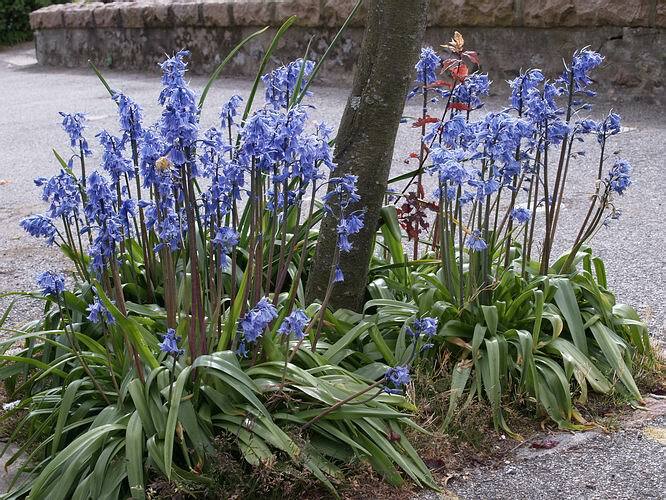 This is the much maligned Spanish Blue Bell -Hyacinthoides hispanica. 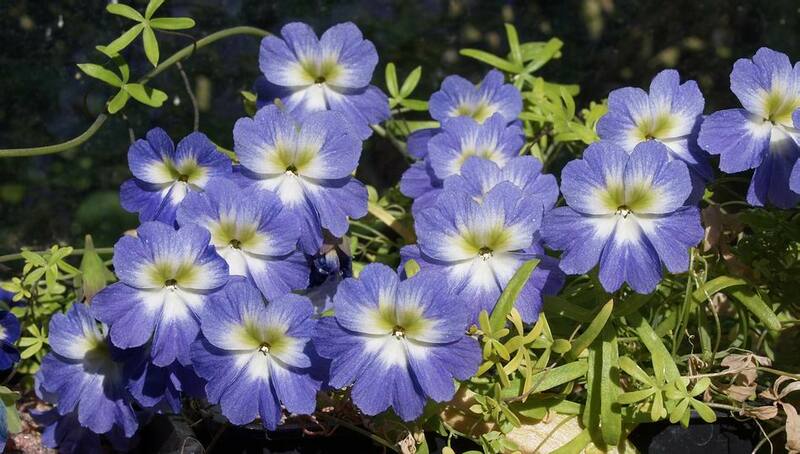 It is a beautiful vigorous plant with good heads of blue bell shaped flowers - the problem with it is it is can take over if it is not carefully managed. 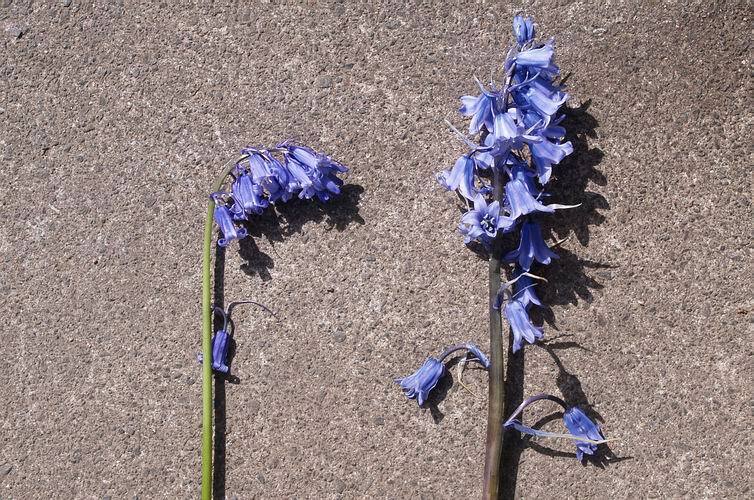 There are worries that it will drive out the native Hyacinthoides non scripta -on the left above- which is not so robust and vigorous a grower - then there is the issue of hybrids between the two species like the one on the right. 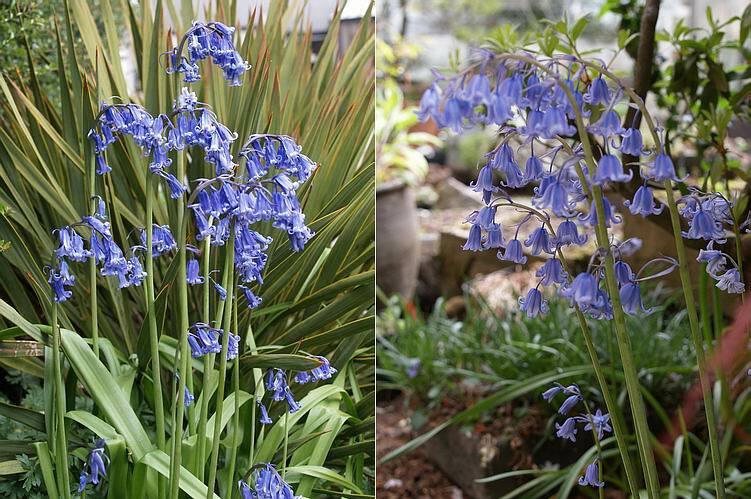 Hyacinthoides non scripta is on the left and hispanica is on the right - it is easy to see the difference between the two species but when you start seeing the hybrids it get very muddled as they vary considerably, some favouring one parent over the other and vice versa. 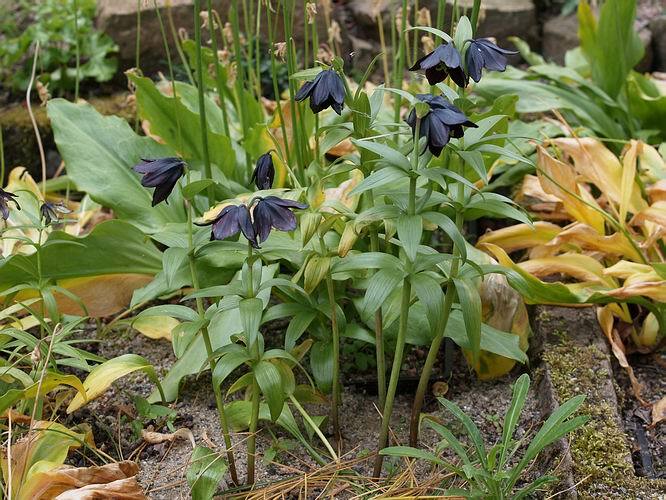 Fritillaria camschatensis is a wonderful garden plant if you can find a suitable position with well drained soils that remain moist through the growing season - this will probably require you to provide the water. 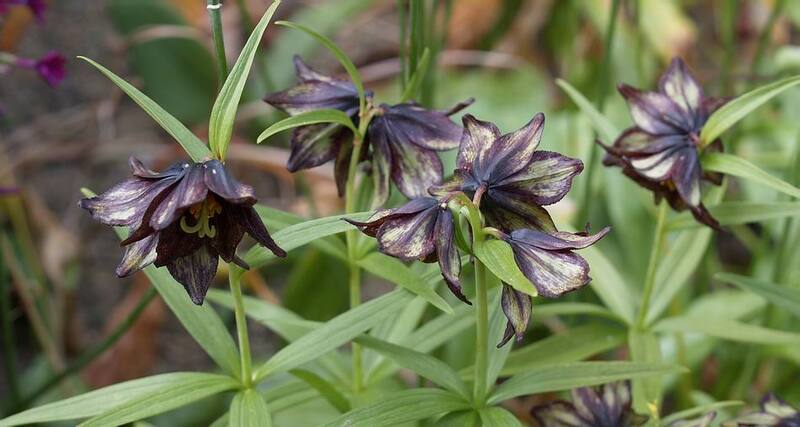 This is a selection of the Alaskan forms which always have some green in the flowers. 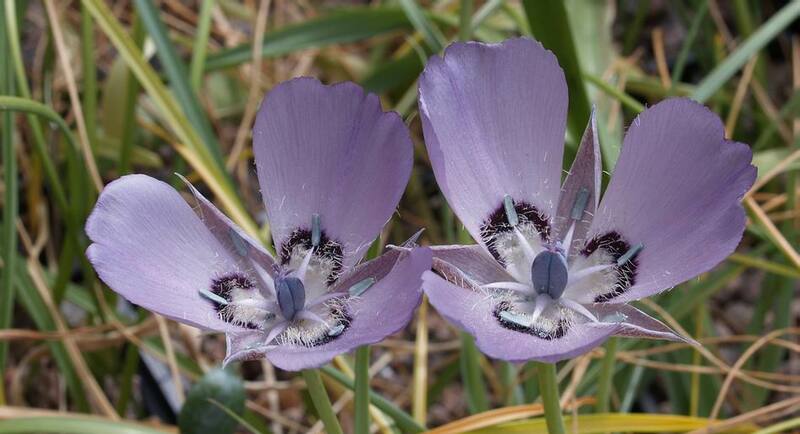 As well as having varying degrees of green these flowers are also smaller than the Eurasian forms. Here is a group of the Eurasian form growing in a mesh basket in one of our sand plunges. I used to repot it every year placing it well down in the compost as I always do but then I left a basket for about three years before I re-potted it and to my surprise it flowered so much better than the ones that I re-potted annually. It was only when I emptied out the neglected basket that I discovered the reason - the bulbs had worked their way up to almost the surface. 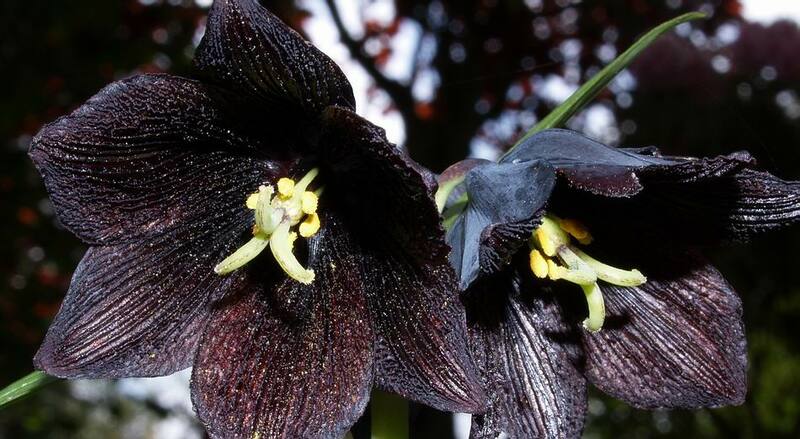 I found them sitting just below the sand - I plant the bulbs into the baskets in my normal potting mix and then top the plunge off with two to tree centimetres of sand. Obviously it is there preference to grow near the surface and there was I placing them deeper every year. It is important to observe your plants carefully and learn to react to their messages. 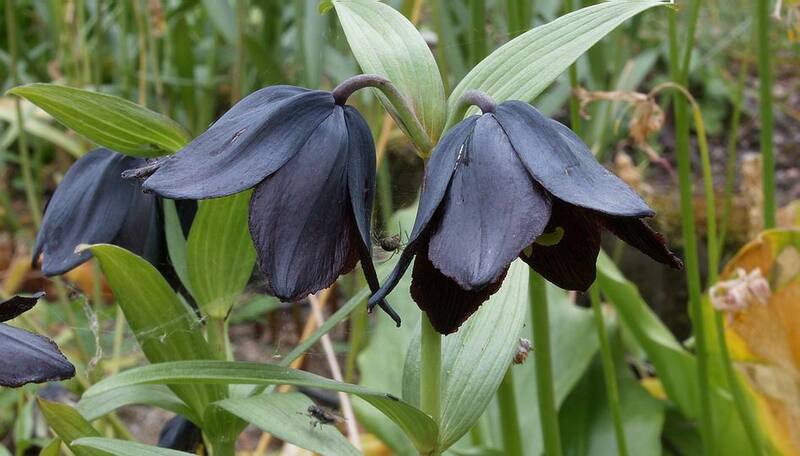 The black flowers are pollinated by flies and there are always plenty of them flying around our plants. A clever little spider has a prime location for her web placed to take advantage of the lure of the flowers. A flash photograph to show the details of the inside of the flower with its deeply ribbed segments. One of my favourite small onions is Allium yosemitense - if only I could prevent the stems from etiolating it would make a cracking show plant. 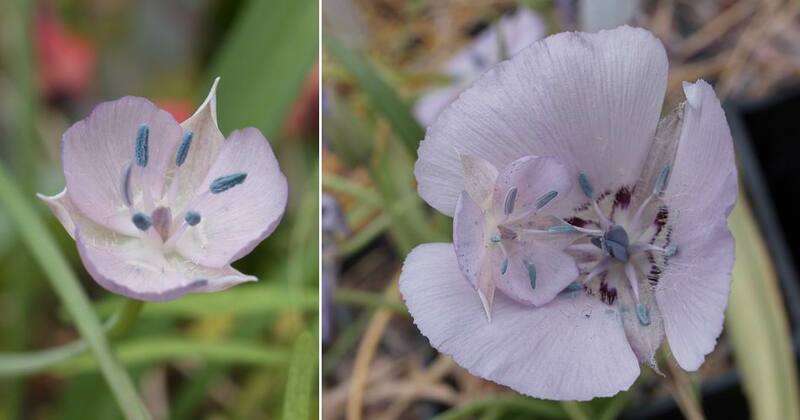 Here is a beautifully marked form of Calochortus uniflorus one of a group I grew from seed that I got from Pam Eveleigh; they are so much better than the one I used to grow. 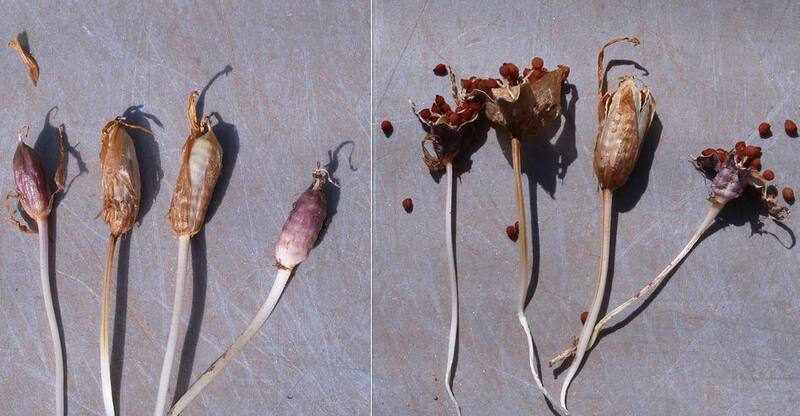 On the left is the old form that I have grown for years and on the right I have placed one of those on one of the seed raised forms, to show the difference in size of the flowers as well as the markings. Here you can see the plants which I am still watering, unlike the pots around it which are all now dormant. 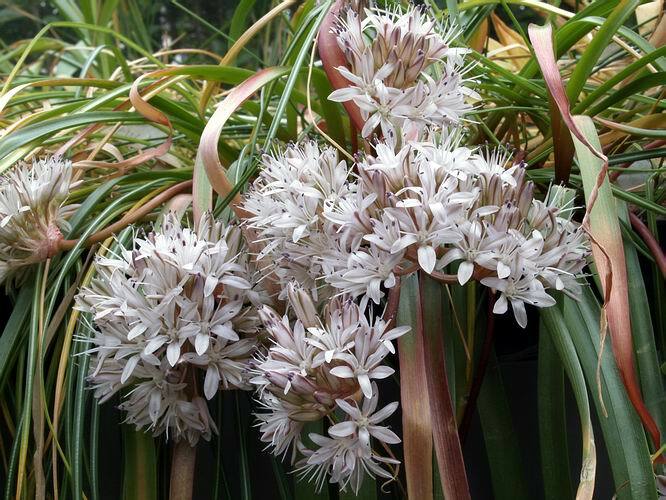 It is important to provide plenty of water to your bulbs when they are in active growth and the best way to judge that is to look at the leaves. Healthy green leaves means the plant needs water - once the leaves start to go yellow then reduce the watering. Notice some of the stems have turned down and the seed pod is swelling nicely, giving me hope of a good seed set. 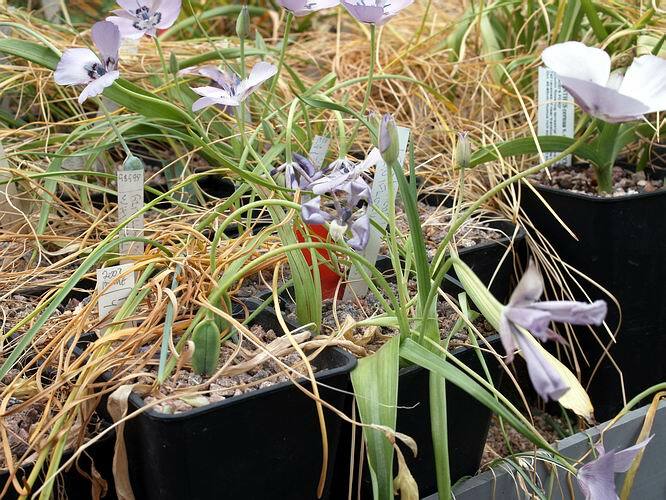 Talking of seeds this has been a very poor year for seed on our bulbs with only a few, like this Crocus pulchellus, obliging - the reason for the failure was that the cold conditions when the plants were in flower were not conducive to pollen growth. Interestingly I placed these seed pods on a grey tray to photograph them then I went for my lunch - one hour later I came out to find some of the capsules had sprung open. 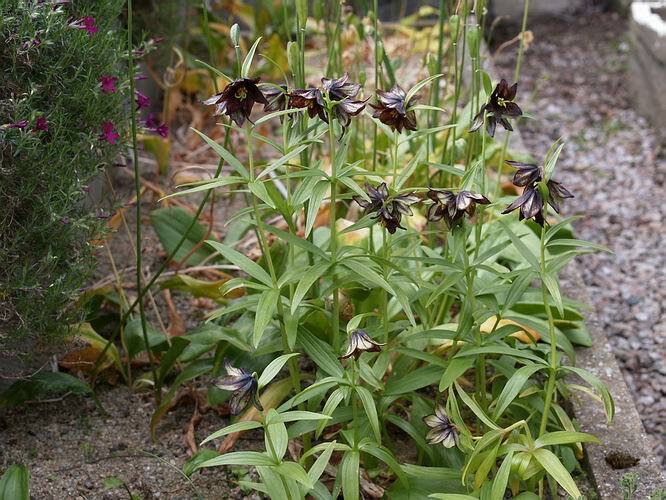 A pot of Tropaeolum azureum seedlings are still flowering away in the frit house and these are also receiving regular watering until the leaves show signs of yellowing when I will withhold the water. 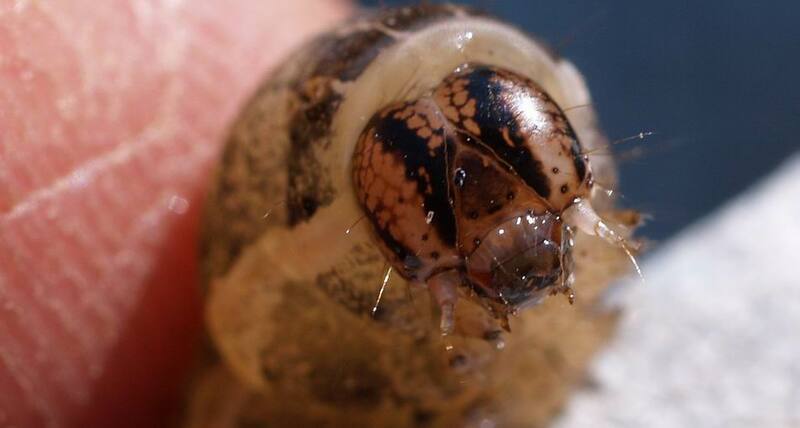 This is the business end of one of the cut worms that is chewing its way through our garden. Do you remember the curled up cut worm I showed a week or two ago? I had intended to show more details of it then so I left it on a low window sill in our kitchen hoping to catch it stretched out and moving. Well it disappeared when I got distracted for five minutes and I could not find it any where. It either moved quicker than I thought it could and is hiding in a dark corner of our kitchen or Lily our wee dog ate it - there is a change: Lily eats caterpillar! !